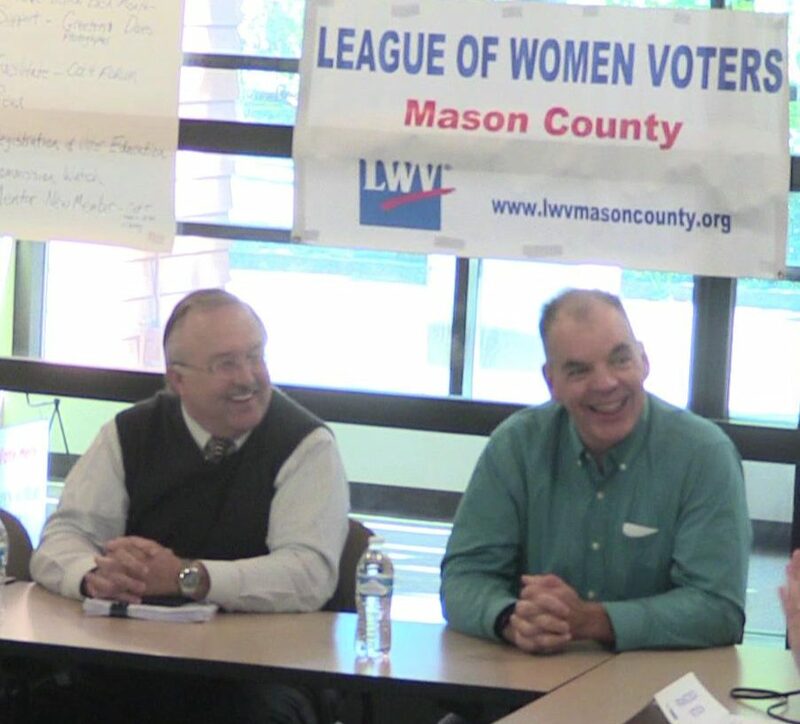 [VIDEO] The candidates running for Mason County Auditor, Charles Rhodes and Paddy McGuire, faced off Tuesday before the League of Women Voters of Mason County. The League held a separate debate for the Auditor candidates since they were unable to include Rhodes and McGuire in their “Speed Dating” Candidates Forum on October 4th. The “Speed Dating” forum is one of three forums, MasonWebTV Powered by HCC will be broadcasting. The first is Monday in Belfair. The North Mason Chamber of Commerce and the North Mason Community Voice are holding a candidates’ debate at the HUB Center for Senior Services in Belfair beginning at 7 PM. This debate will feature the candidates running for Mason County Assessor, Mason County Auditor, Mason County Commissioner District 3, Mason County Sheriff, Mason County District Court Judge and 35th District Senator and Representatives. The League’s “Speed Dating” Candidates Forum is set for 6:30 PM Thursday, October 4th at Mason PUD 3’s Auditorium and will feature the candidates running for Assessor, Commissioner District 3, Sheriff and District Court Judge. Under this format, the candidates will move from table to table, answering questions directly from those at each table for a set period of time before moving to the next table. This process will continue until each candidate has been to every table. MasonWebTV Powered by HCC will broadcast from one table as each candidate comes to that table for their Q & A. The final candidates forum is Tuesday, October 9th. The Shelton Mason County Chamber of Commerce is holding this forum at Olympic Middle School in Shelton beginning at 5:30 PM. This forum will feature the candidates running for Mason County Assessor, Mason County Auditor, Mason County Commissioner District 3, Mason County Sheriff, Mason County District Court Judge, 35th District Senator, 35th District State Representative Position 1 and 35th District State Representative Position 2.